Use Grammarly to improve spelling, grammar, punctuation, sentence structure, and style in your writing. Grammarly is a free service for UPEI students, staff, and faculty. Update - March 2018: If you're having trouble logging into your Grammarly account, and are being redirected to a webpage that asks for a quote, try clearing your history and cookies or opening an incognito window. We apologize for the inconvenience. Go to https://www.grammarly.com/edu/signup to create your account. You will need to use your UPEI email address to sign up. Check your UPEI email for your Grammarly activation notification. Now you're ready to use Grammarly! Grammarly is an automated revision tool that helps you identify ways to improve your writing skills. Using in-text editing, Grammarly checks your work and provides suggestions on proper word choice, grammar, punctuation, and writing style. This service allows you to proactively correct your research essays before they are submitted. What can I do with Grammarly? To begin, simply upload a document into Grammarly, or copy and paste your text. If you upload a file, you will also be able to download it from Grammarly using the same file type. 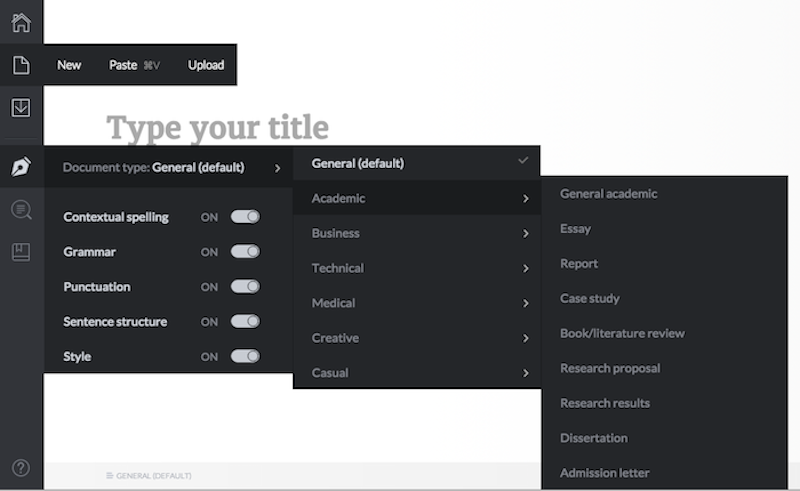 Use the buttons on the black bar on the left to decide which editing tools you will use; you can pick any or all of contextual spelling, punctuation, grammar, sentence structure, and style. You can also indicate what type of document you are working with; academic essay is the most common choice. Grammarly will identify possible mistakes and suggest corrections. You are not required to accept all of Grammarly’s suggestions; please use your judgement to decide if the suggestions are appropriate for your work. Grammarly will explain its corrections, which allows you to not only learn about grammar and writing styles, but also to determine if you’d like to accept Grammarly’s corrections. You can accept, examine in detail, and delete corrections. You can also undo deleted corrections if you change your mind. Edits in Grammarly are automatically saved, so you don’t have to worry about losing any changes. When you’re satisfied with your essay, you can simply copy the text and paste it into a word processor, or download your document (for example, if you uploaded a .docx, the download will also be a .docx). Important Note: There is an option to use a Plagiarism checker, but it is not comprehensive. It does not check any of the Library’s resources like e-books or journal articles. Please do not rely on the Plagiarism checker to ensure you have properly cited references in your work. For a more comprehensive essay review, consider making an appointment with the Writing Centre.